Built to military specs but priced for a civilian budget, the AimShot HG-Pro Reflex Sight is the pinnacle of tough and durable reflex sight technology. Built to withstand image any environment, the AimShot HG-Pro Red Dot Sight is crafted from top-quality 6061 T6 aircraft-grade aluminum, and is waterproof to up to 30 meters. This Aimshot red dot sight features an integrated rail mount with a quick release lever for easy installation and removal on any Picatinny or Weaver rail system. 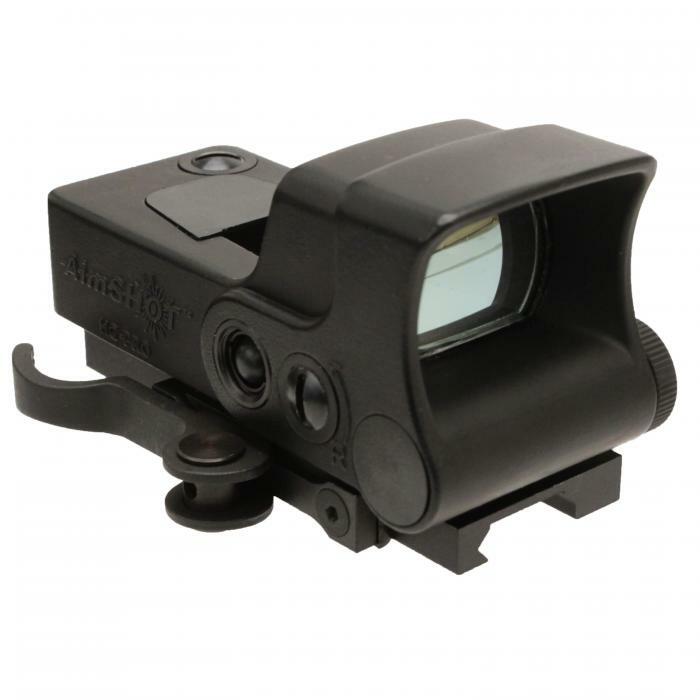 This Red Dot Sight by AimShot provides full windage and elevation adjustments and nine levels of brightness adjustment including a setting for use with night vision equipment. The Aimshot HG Pro Red Dot Sight has a large, 34mm coated reflex lens that is parallax-free, and allows for rapid target aquisition. The sight is powered by a single CR123 battery with an operational life of over 2500 hours. • Dimensions: 4.75" x 2.25" x 2 "
• Weight with Battery: 10.7 oz.